OK people, it’s time for brunch again. It is the best time. And today we’re going on a culinary trip to a country I’ve long wanted to visit: Morocco. Today for brunch we have Moroccan eggs and I couldn’t be more excited. 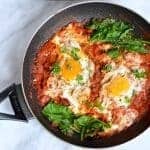 If these sound familiar to you then you’ve possibly been reading Ottolenghi, but this mix of eggs, tomatoes, paprika and spinach is a great way to spend a lazy morning. 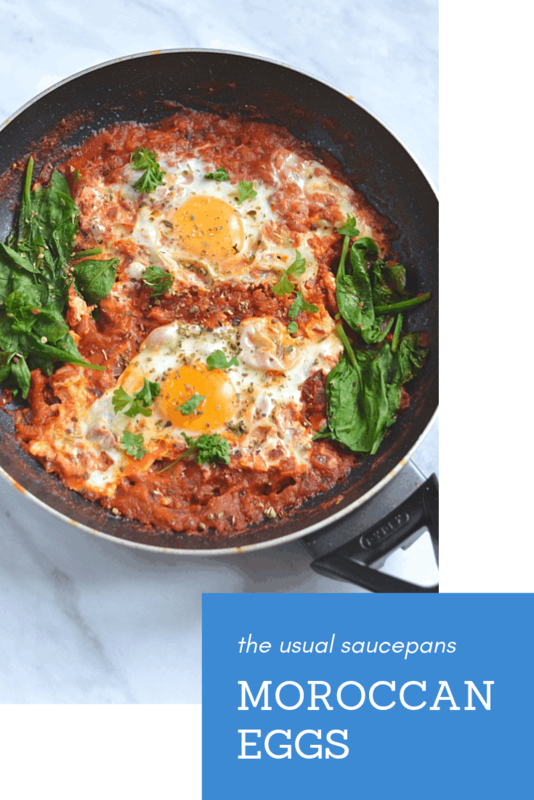 You may also know it as shakshuka, but as I’ve not really stuck to a traditional recipe it doesn’t feel right to use the name. 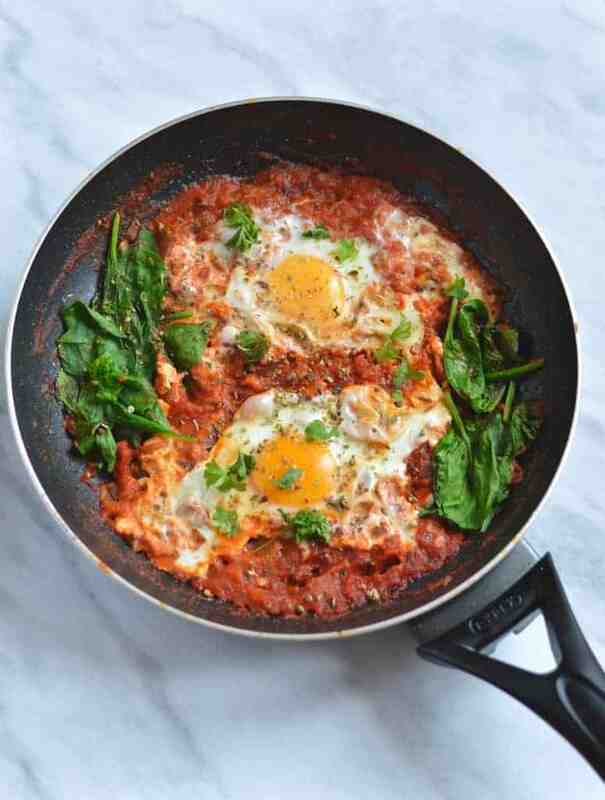 Maybe we could go for Moroccan eggs, inspired by shakshuka. Moroccan eggs for short. Why do you need this in your life? 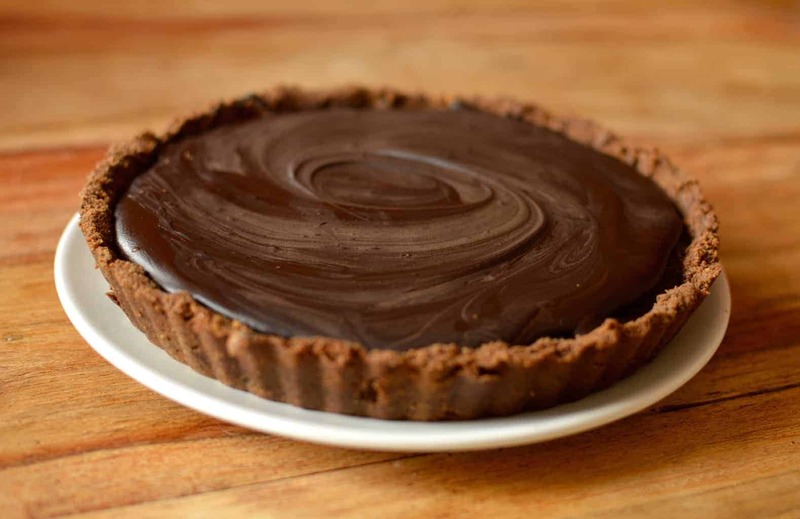 Well, for starters look at it – why wouldn’t you want it? But seriously, this dish is all over a good brunch idea. There’s flavour galore, there’s protein, there’s colour, there’s goodness, and above all, there’s just loads of deliciousness. Can you tell I’ve fallen for this dish a bit? I like brunches that aren’t overly complicated, that you can share with friends and that aren’t so carb-heavy that you end up napping afterwards. 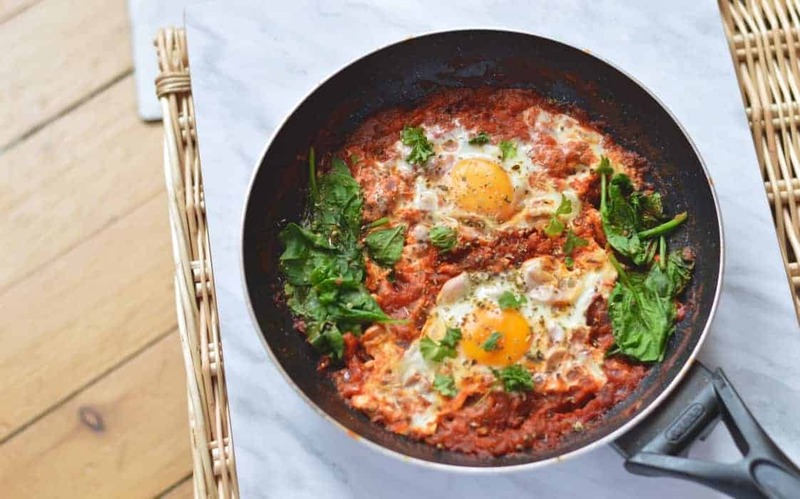 These Moroccan eggs deliver on all those fronts. It’s really easy to make – even with a killer hangover you can crack eggs and stir a bit. You can even just put the pan down in the middle of everyone and let them dig in if you’re looking to save on the washing up. Above all this is a dish to share. I made mine for two, but it’s easy to scale up to however many you want to feed. You could also scramble the eggs on the side if people aren’t fans of them like this (be nice, don’t judge, this was me until recently). Brunch is best served with friends, and these Moroccan eggs are no exception. If you want a little bit more you can add some toasted sourdough on the side, or simply just a large pot of coffee. This is a fantastic brunch option – especially if you’re up early and feeling healthy (or need something to slightly restore your health balance…). It’s bright, tasty and pretty good for you too. Start by dicing your onion and crushing the garlic. Sauté in a large frying pan on a medium-high heat until soft, then stir in the tomatoes. Turn up the heat to bring the pan to the boil. Once boiling, reduce the heat, simmer for 10 minutes whilst the tomato juice boils off. Stir through the salt, pepper and paprika. Make two wells in the mixture and crack an egg into each. Turn down the heat and cover. Cook for 2-3 minutes. Add the spinach and then cover again for another 2-3 minutes until the eggs are cooked and the spinach wilted. 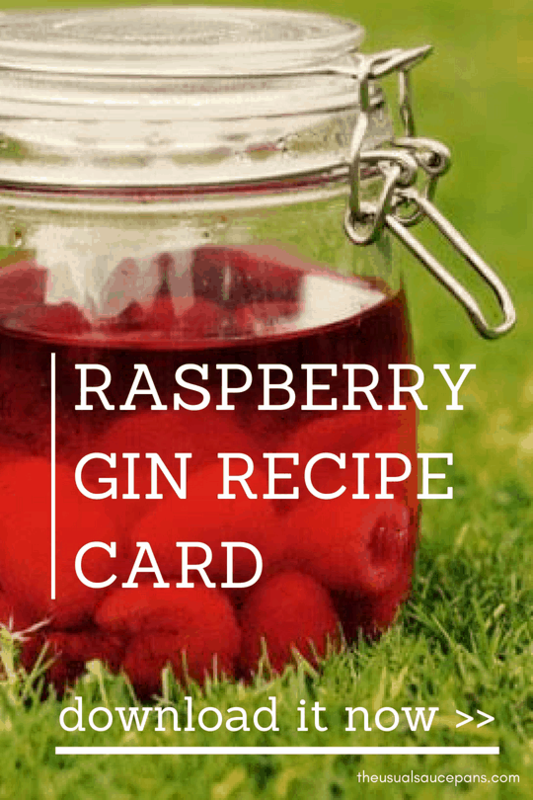 Garnish with the coriander and serve with slices of toasted sourdough.